Tickets are now on sale for the Cash for Christmas 50/50 charity raffle. Tickets are $5 each and may be purchased from any SIDC committee member (see list of members here: link to member names on site) or at the Stanardsville branches of United Bank and Pioneer Bank. The grand prize winner will be drawn at the Tree Lighting ceremony as part of the Parade of Lights event on December 1st. The grand prize winner will receive one half the value of the tickets sold. You do not need to be present to win. Additional rules apply. The winner, once the results are finalized, will receive a check on Saturday, December 8th at a photoshoot scheduled for Town Hall—well in time to enjoy the money in their Christmas shopping plans. 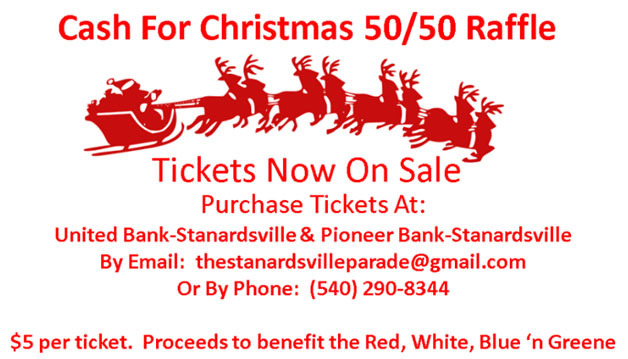 You can purchase tickets at United Bank or Pioneer Bank in Stanardsville, by email at thestanardsvilleparade@gmail.com, or by phone at (540)290-8344. $5 per ticket. All proceeds to benefit the Red, White, Blue ‘n Greene 4th of July celebration.